Welcome to Black London Histories. 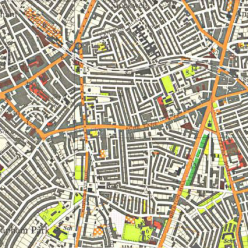 This website is a digital mapping and blogging platform exploring histories of black London life, culture, and politics, covering the period from the 1958 white riots in Notting Hill to the 1981 Black People’s Day of Action. The above map provides a live view of the sites mapped. Click the pins on the map to read more about the locations, and also to follow links to blog posts on the histories of these sites. The blogs are interim essays emerging from my research project. You can read more about the project here, or look through the existing blogs via the site menu. Please feel free to use information from the map and blogs in your work, but please do credit the website when you do so. This site is built and maintained by Dr Rob Waters. I am a Leverhulme Early Career Research Fellow in History at the University of Sussex, and a member of the Raphael Samuel History Centre. To contact me, please visit my staff page here. The project is funded by a Leverhulme Trust Early Career Fellowship.